Death is a natural part of life but most of us avoid discussing our mortality, and the final journey we must inevitably take. Learning more about this challenging subject, however, can actually empower us and reduce the uncertainty and fear we sometimes feel. It is best to prepare and educate ourselves on the end-of-life process, on how to plan a meaningful funeral or memorial service, and on how to effectively cope with grief and loss following the death of a loved one. In addition, the end-of-life process neither conforms to a timetable nor follows specific signals that indicate exactly how much longer a loved one will live. For some people, the dying process might take a few weeks, several months, or even longer. For others, the transition from apparent good health to death might occur swiftly—within days or even hours. That said, while there is no universal dying experience common to all, many people still exhibit some physical, emotional, and mental similarities as death approaches. Often, an individual might start to withdraw from family members, friends, and other loved ones, or show little or no interest in the social interactions, hobbies, and/or physical activities he or she once enjoyed. Others might still socialize and receive visitors but uncharacteristically display anger or make it difficult to interact with them or to provide care. Also, the dying often reflects on their lives and might attempt to resolve a troubled relationship or deal with any regrets. Working through The Five Tasks of Dying can help individuals say goodbye to loved ones, find a sense of closure, and achieve a sense of peace as death approaches. Some dying people might experience a phenomenon known as nearing death awareness—a recognition that something is happening to them even if he or she cannot express it adequately. Sometimes dismissed by caregivers as delirium or terminal restlessness, the dying patient might talk or act as if he or she needs to prepare for a journey or share a vision about seeing a deceased loved one or a beautiful place. As death grows imminent, the dying often loses their appetite—even for their favorite foods or beverages—and lose weight. While this might prove alarming to the patient's loved ones, this is a perfectly natural part of the end-of-life journey because the individual's body requires less energy. In fact, the chemistry of the human body can change at this point and actually produce a mild sense of euphoria within the dying person. In addition to not eating or drinking, the dying individual will generally speak little, if at all, and might fail to respond to questions or conversations from others. He or she might sleep a great deal, and physical activity will grow limited if not become absent completely. As the individual's body begins to shut down, his or her hands and feet might become purplish, and blotchy in appearance. This mottled skin tone might also slowly spread upward along the arms and legs. The person's eyes might remain open or half-open, but he or she will not see their surroundings and will usually become unresponsive. Experts generally believe that our sense of hearing is the last sense to cease before death occurs. So, the patient's loved ones may sit and talk to the dying individual during this time, if desired. Eventually, the patient's breathing will cease altogether and his or her heart will stop beating. Death has occurred. A growing paleness to the skin's normal color as blood drains from the smaller veins in the skin. If the body remains undisturbed for long enough (several hours), the blood will pool in the areas of the body nearest the ground and, eventually, chemical changes in the body's cells will result in rigor mortis—a temporary stiffening of the muscles. 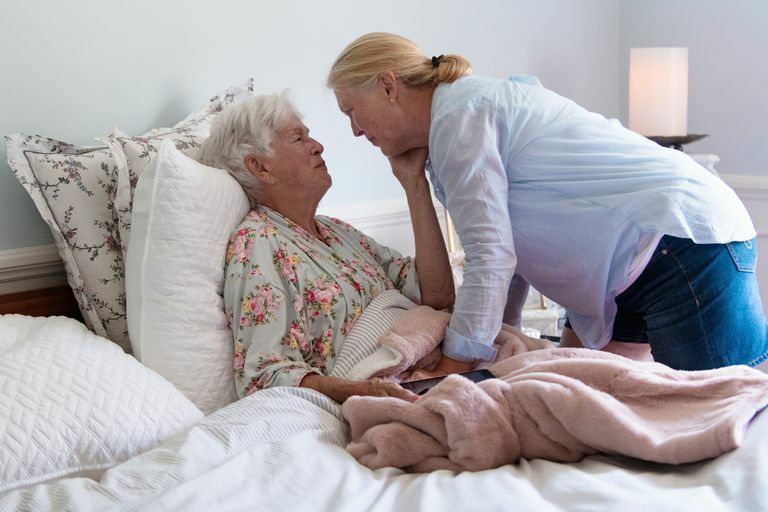 When a loved one dies, there are numerous tasks that survivors should handle immediately as well as various duties they will need to accomplish in the days and weeks that follow the death. If he or she received hospice care at home, then you should call your hospice agency. If the death occurred in a caregiving facility, such as a hospital or nursing home, then personnel there will handle the necessary procedures. After authorities have made an official pronouncement of death, the immediate family or the deceased's next-of-kin will usually begin planning a funeral or memorial service, among the many other necessary tasks that arise. If your loved one preplanned or prearranged his or her funeral or memorial service, then you should contact the chosen provider to discuss the details, and finalize the arrangements. Many families will work with a professional provider, such as a funeral director or celebrant, during a funeral arrangement conference to create a fitting, meaningful service that enables loved ones to honor and remember the deceased while comforting and supporting each other. While arranging the service, you will be asked to provide the information needed to write an obituary and you might decide to write and deliver a eulogy during the funeral or memorial service, too. Some families choose to forego any such services for various reasons. In these cases, they might select direct or immediate burial or direct cremation. As a consumer, you should review and understand the Federal Trade Commission's Funeral Rule, which protects your rights when purchasing goods or services from certain providers (primarily funeral homes). Grief is a powerful, multifaceted, and often uncontrollable response that people experience following a personally painful or traumatic event, such as the death of a loved one. While grief is a perfectly natural and necessary reaction to loss, each person will mourn in his or her unique way, and timeframe. While there are many common misperceptions about grief that can actually compound the sadness and sense of loss we experience while mourning the death of a loved one, there is no disputing that grief can significantly disrupt our normal lives and routines. The sadness and pain caused by grief can create genuine physical effects on our bodies, such as digestive problems, pain and discomfort, and weight gain or loss. You might even find it challenging to return to your job or office while you're mourning. Because you might have trouble thinking clearly at this time, there are several life decisions you should delay making for a while, if possible. There are no predictable stages of mourning. Instead, our reaction to the death of a loved one is deeply personal, and each of us must find ways to cope that work for us. Some people prefer to grieve by themselves and do not want or need outside assistance. Others might seek and find comfort in sharing the pain, anger, depression, and other emotions they feel following a loss by joining a bereavement support group in their area. There simply is no correct way to mourn. If you would like to provide support and comfort to a grieving family member or friend, there are many practical ways you can help them as they cope with their loss. While it generally seems difficult to find the right words to comfort a griever—and many people say the wrong things—there are definitely meaningful, uplifting expressions of sympathy you can offer. But perhaps the most valuable gift you can offer to someone mourning a death is your quiet, physical presence and unwavering, non-judgmental support.